I am guessing that some of us are right in the middle of canning season, some of us are just beginning the canning season...regardless of where you are in you're "bottling adventures" I am sure that you are having a blast, right?! I say that with a very strong sound of SARCASM in my voice because bottling food is one my VERY LEAST favorite things in the entire world to have to do...BUT I do it because I love the fact that I CAN (I am able...even though I complain about it) and that I have the means to do it (a garden full of tomatoes). I also love seeing my full jars of yumminess and sitting on the shelves. I like knowing that I made it without preservatives and "all the extras" that go into the store bought stuff. This delicious recipe is one that I requested from one of my life long friends, years ago. She loves to bottle food and has the wonderful talent to be able to bottle just about anything and have it turn out fantastically. Not only does it look pretty in the jars, but it tastes amazing as well...she is just an awesome woman! 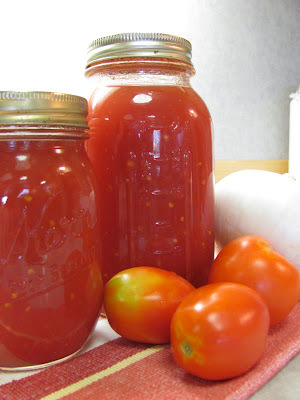 I love this recipe because it tastes so good and yet it is fairly easy (when it comes to bottling food...its all about time and patience...but other than that part, its easy) and have used it for almost 20 years. Hope you find it as scrumptious as my family does. *When I make this recipe I cut the tops off of the tomatoes and cut them into fourths. I cut the tops off of my peppers and cut them into pieces. I chop the onion into chunks and then I put everything (all vegetables) into my blender and blend them up (a small amount at a time of course). Then I put it all into a large black cooking pot that I bought specifically for canning. My family doesn't like "chunky sauce" so this process eliminates any of the chunks. IF you want to, you can blanch and skin your tomatoes first and then cut them into small pieces and put them in your pan or blender...but I don't, I throw them in skin and all, you do it however you like it. If you don't want to blend the vegetables up, you certainly don't have to. Just cut them into smaller pieces so they cook down faster and put them in your pot. Next step after your tomato, pepper and onion cutting process---put garlic powder, sugar, salt, oil, basil and oregano into pot with vegetables. Bring to a boil and let boil for 1 hour, stirring frequently so it doesn't stick to the bottom of pot. Add tomato paste and boil for 30 more minutes. Put in clean quart or pint jars and water bath for 30 minutes.